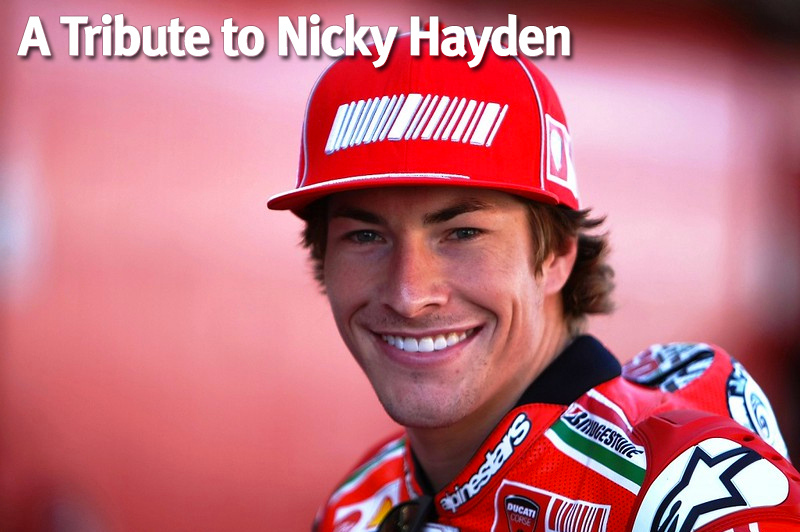 It has been some number of days now since Nicky Hayden passed away in a cycling accident. The world of motorsports still hurts with the void left behind. The Kentucky Kid, as he was known, was special in the high profile world of top-level motorsport athletes. His character, his work ethic, his love of riding and racing, his easy-going personality, and the time he made for his family and fans is what puts Nicky a step above any other athlete in motorsports. It is said over and over Hayden was the nicest guy in motorsports. He was the commensurate professional and never spoke negatively of anyone. I first started watching Nicky Hayden in 2003 when he started racing in MotoGP. I had just moved back home for grad school, and I was living with my parents who happened to have cable tv with Speed Channel, something I had gone without when I had to pay my own living expenses. I didn’t know anything about him at the time aside from the fact he was American and racing at the top level of motorcycles for Honda. I had also just gotten my first motorcycle, a 1998 Honda CBR 600 F3, because, you know, I needed a way to get to school and motorcycles had the best parking on campus. At least that’s what I told my parents. Over the races and over the years, everyone got to see what kind of person Hayden was and his character. In contrast to what we see often in NASCAR, Indycar, and F1, Hayden never bad-mouthed anyone. When his bike wasn’t working well, he never spoke poorly of his team. His response was always that he would go out and work harder. He also always thanked his team for their hard work. During test days, Hayden was renowned for his work ethic, often putting in the most laps of any rider. I think the most negative thing I have ever heard Hayden say about anything was when Dani Pedrosa, his own teammate, took Hayden out in the next to last race of the 2006 season, costing Hayden the lead in the championship to Valentino Rossi. “I don’t know what to say really – it just hurts,” said a stunned Hayden. “Everybody’s made a big deal about team orders, but I don’t sign (Pedrosa’s) cheques, so I can’t tell him what to do. I didn’t expect Dani to pull over and let me by, but I definitely didn’t expect him to do that. “We should have had a plan in place – even when I passed Dani the first time he did not want to give the position to me,” continued Hayden, his voice breaking. “I mean I had to get off the brakes just to get back by him. He had no orders – Honda didn’t tell him not to race me hard – but I was watching Colin just following (Yamaha’s) plan perfectly. Yes, any normal person would have likely have lost their minds and wanted to beat the living snot out of Pedrosa (Aaron Yates drop-kicking a guy at the Daytona 200 in 2004 comes to mind). But not Hayden. Hayden went from leading the championship to being eight points down on Rossi, arguably the greatest motorcycle racer of all-time, with only one race remaining. However, Hayden never gives up despite the odds. With that work ethic, Hayden was able to beat Rossi and win the championship in the final race. There’s a fantastic story just written about the American flag Hayden took on his championship victory lap posted at Sportrider.com again giving a glimpse of the amazing character of Hayden. Hayden’s never-die attitude reminded me of his race at Indy in 2010. On the third lap of the race, he lost his left knee slider after the front-end washed out a bit, and he had to put the knee down to recover. The corners had these drain covers which caused the knee slider to get knocked off. The thing with Indy is of the 16 turns, 10 of them were lefts, so losing the left knee slider was a huge disadvantage. Hayden was able to salvage a 6th place finish touching his leathers down on the track.